We’re Clarisse and Max, a couple from France and we are selling our Nissan Vanette petrol from 1989 (225 000km) fully equipped with camping stuff. -	And a great radio CD, MP3, USB key, SD Card etc….! We passed the WOF with success and the garage just fixed a wheel bearing and a leakage on the exhaust pipe, I still have all the invoices and papers! I have nothing special to add just that this van is perfect to travel when you’re 2 people or a couple like us, we even travelled with 1 shortboard and my longboard above our heads and we still had enough room ! 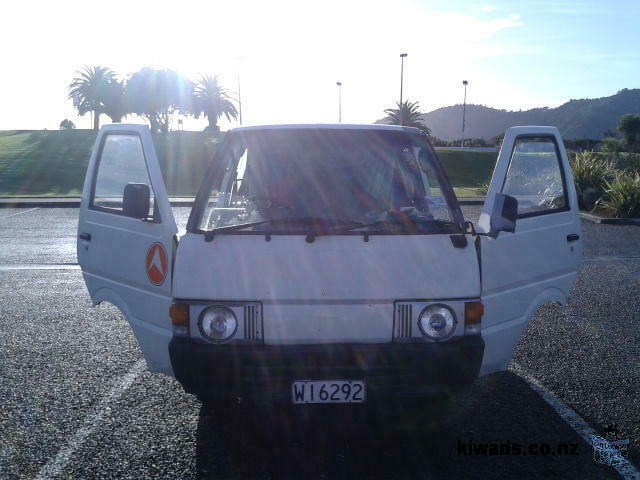 The van will be available mid June in Auckland (not later than the 24th) but if you want it and you’re coming earlier in NZ or you’re somewhere else in the country don’t hesitate to call, we could maybe find a solution!